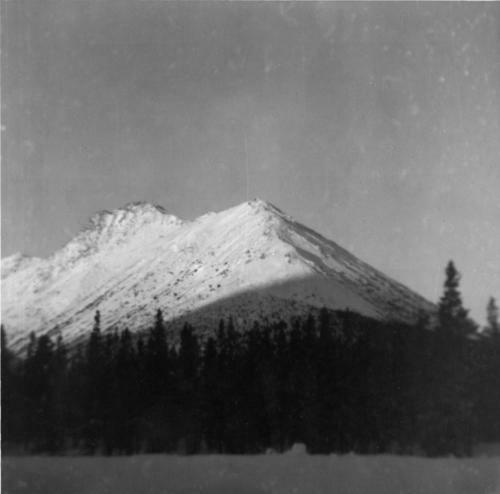 Photograph depicts snow-covered mountain north of townsite, partially covered in shadow. Photo taken with sun at highest point in the sky. Plant site clearing in foreground, trees behind clearing. Handwritten annotation on recto in blue ink: "MOUNTAIN NORTH OF TOWNSITE FROM PLANT SITE CLEARING. INDICATING DARKNESS IN VALLEY WHEN SUN AT HIGHEST POINT DEC. 22/51" "T.T.T".